Keeping cozy while looking chic is a true art I tell ya! I find it a struggle to look polished and professional in the office but staying warm without showing up in a giant snuggie with heels. Thankfully, Joe Fresh always comes to my rescue when it comes to a Canadian winter. A long time-fan of the brand, I can always rely on them fashion-forward items - like these piped joggers - and wardrobe staples like this fair-isle sweater. I also love, love, love their black opaque tights in the winter - you only need 1 set to get you through the season! Whether it's cozy pyjamas, seasonal dresses or even cozy athletic wear - I definitely suggest checking out their current collection. And how about this incentive? From now until December 20th, you can earn 25% off your purchase from Joe Fresh by using the code, KRYSTIN, on your order (includes regular priced and clearance merchandise). Oh and did I mention free shipping? Uh huh! Would love to know what you ended up snagging! This post was sponsored by Joe Fresh. All thoughts and opinions expressed are my own. 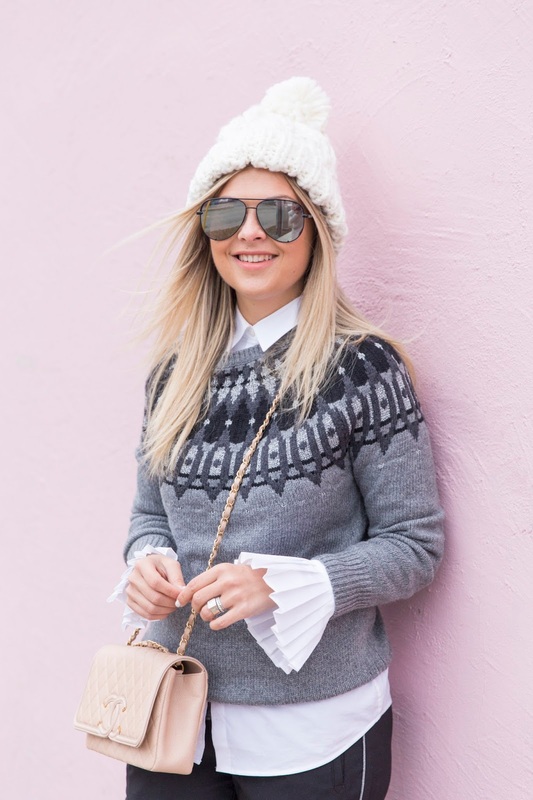 Loving the bell sleeves peaking underneath the sweater! Your pants and sweater are fantastic! I'm loving this juxtaposition of the track pants with the crisp white shirt and sweater. So many textures and fabrics, it's a great combo. This also looks like it would be super comfy AND warm to wear to the office (which for me seems to always be freezing, no matter the season). Great pieces and such a good deal from Joe Fresh!